An addition to a 1930s Tudor Revival house is designed to be both sympathetic and distinct. 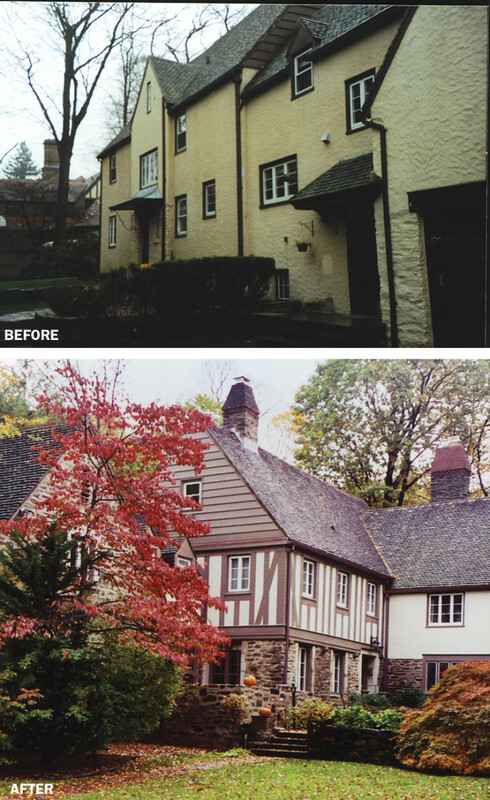 Martin Brandwein, Architect, provided a client with a sympathetic addition to their 1934 Tudor Revival house in Scarsdale, NY. Tudor Revivals, alongside Colonial and Spanish Revival houses, abound in Scarsdale, NY. The railroad station through which people enter the town is in this style, and it was used abundantly between the two World Wars. A recent addition to a 1934 example stays true to the style and follows the narrative of the original. The 460-sq.ft. addition comprises a large kitchen, a new larger formal dining room and a separate mudroom half a story down. The kitchen was the main impetus for the project, as the client wanted a larger, more open space for cooking that would include space for children. The quasi-public spaces – the kitchen and dining room – were meant to be important, yet subordinate to the rest of the house. 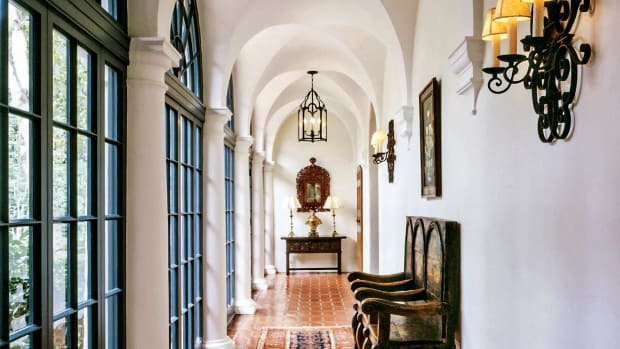 “Tudor Revival houses often contain a series of small boxy spaces,” explains Martin Brandwein, of Martin Brandwein Architect. “The challenge was to create open spaces, yet make them defined so that the addition fit in with the rest of the house.” To accomplish that goal, the architect designed open spaces, but framed them with short walls, crowns and beams. As a result, each room reads as its own space. The design is “kind of like a pinwheel, where the activity is in the kitchen and everything else gravitates out from there.” In this way, the architect was able to design to a concept for contemporary living and place it in a 1930s Tudor Revival house. The kitchen was designed to be the focal point of the house. 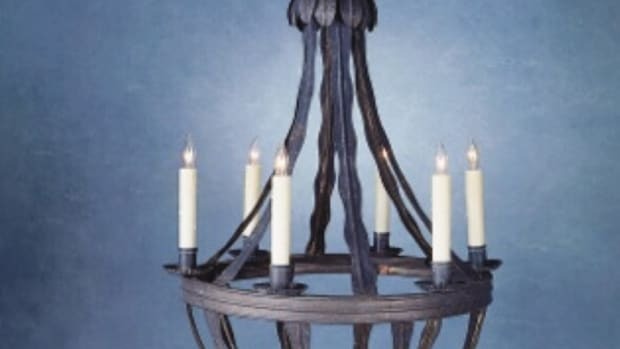 It features a LaCornue range and stove from France, a custom-made island and Dutch Makkum tile from Royal Tichelaar Makkum in the Netherlands. All the cabinetry is custom made of white oak by Vella Interiors of Long Island City, NY. 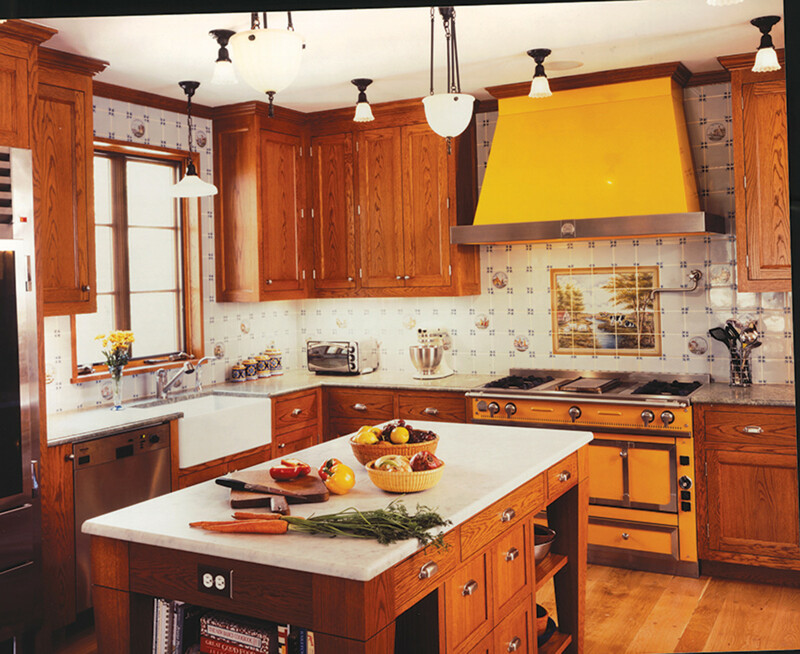 Traditional materials on the interior, including oak cabinets, an oak island and Dutch-tile backsplashes in the kitchen, link the original parts of the house to the addition, while the bright yellow range creates a focal point. Wide pine flooring was carried from the rest of the house into the new spaces. 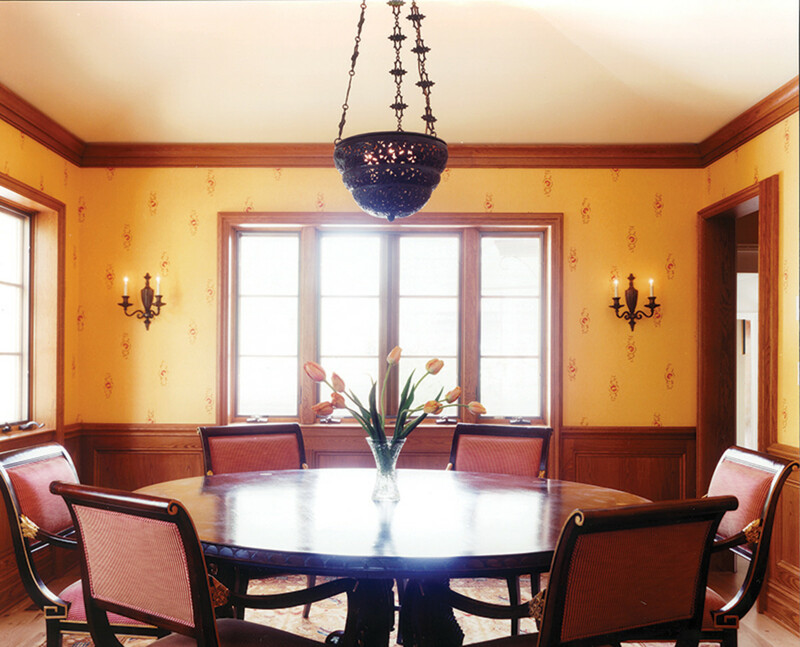 The dining room features a tray ceiling and oak paneling and trim by Vella Interiors. The new dining room features a tray ceiling with oak trim to increase the height of the room, standing in contrast to the rest of the house, which has 8 1/3-ft. ceilings. “This was an opportunity to make a distinctive space and something much taller and grander, with a loftier expression,” explains Brandwein. The old dining room is now a play room, and the new breakfast room (the old kitchen) features new wood cabinetry, a new painted wood shelf unit in the wall and a new wood crown and base. Clad in fieldstone with a copper standing-seam roof, the addition “harmonizes with the existing house and creates a welcoming car court,” says Brandwein. “What I wanted to do was to improve the appearance of the house without overwhelming it. 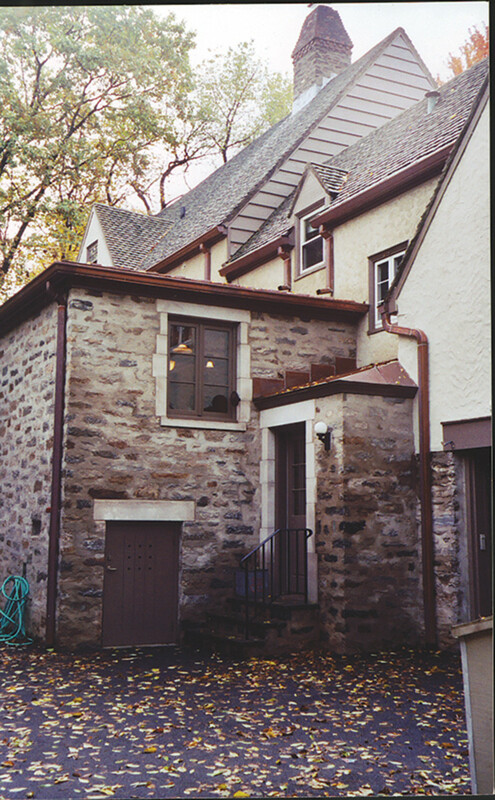 Mostly the addition was made to the unattractive, painted stucco wall on the north side of the house where I wanted to create more visual interest.” The fieldstone was used in the addition to tie it to the rest of the house, however, cut limestone surrounds with quoining dress up the windows of the dining room and kitchen to indicate the public character of these new spaces. Because of setback regulations, there was a limit on how far out the addition could be built. “We couldn’t design the walls to be thicker because valuable interior space would be sacrificed,” explains Brandwein. As a result, matching the new and old stone presented a challenge, since the new stone was 5 in. thinner than the existing stone veneer. A mason was hired to match the thinner veneer to the existing stone convincingly, so that the interior space did not have to be diminished, yet the code was also followed. 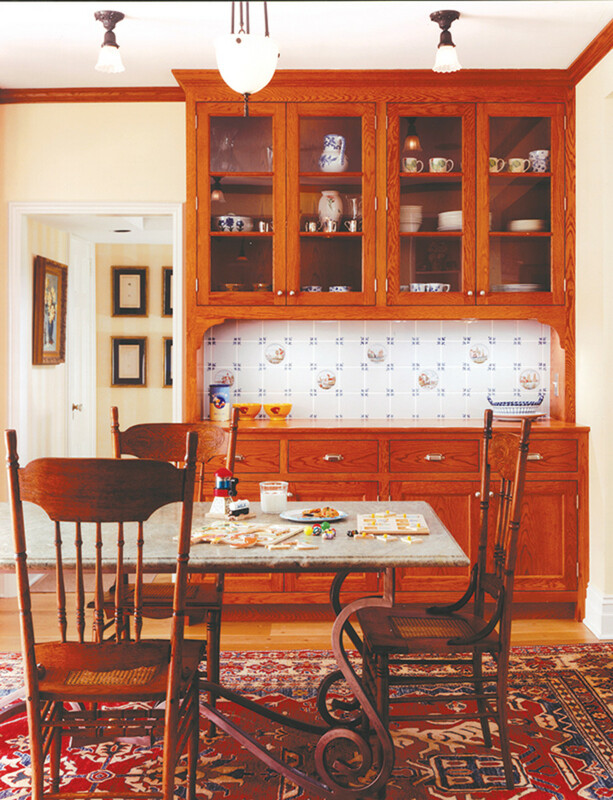 The original kitchen was turned into a breakfast room, which features a custom table and glass-fronted cabinetry. The cased opening leads to the service stair and rear entry. The roof of the addition was executed in copper for several reasons. First, the copper set the addition apart from the rest of the house, following the idea that it was built at a different time than the main part of the house. Second, Tudor Revival houses often feature steeply pitched roofs. However, because of the upstairs windows, the roof on the addition had to have a lower slope. Clay tile found on the existing house was not appropriate for that, says Brandwein. Last, the copper tied into some of the decorative elements on the house, such as the awning; the existing aluminum gutters and downspouts were replaced with copper as well. The renovation included re-painting the exterior trim and stucco. Wood casement windows, similar to ones on the first floor, were used on the addition, but existing vinyl windows could not be replaced during the renovation because of budgetary concerns. New asymmetrical openings on the exterior are in keeping with the existing character of the side and rear elevations. “This project was not focused on symmetry or formality. It has a more organic quality, and grew from the inside out,” says Brandwein of the completed project. Originally designed by architect F. Burrall Hoffman in 1902, Westlawn is a shingled Revival house located in Southampton, New York.